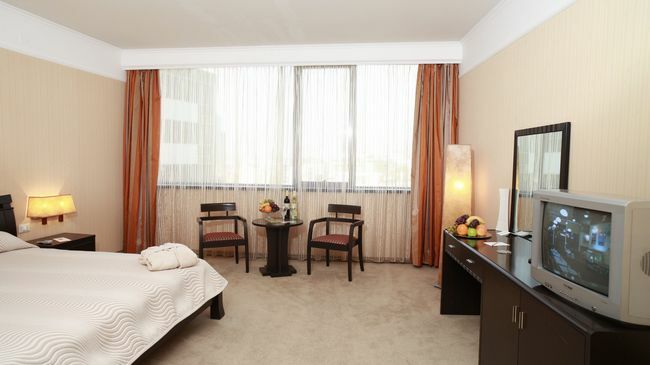 ?he 4-star hotel is located in one of the most quickly developing area of Sofia ? the capital of Bulgaria. The hotels perfect location offers quick access to both the city downtown and some of the most famous landmarks in Sofia: the National History Museum and the Boyana Church founded 1259, part of the UNESCO World Heritage List and the National Park Vitosha. Sofia is Bulgaria's capital and largest city in the country. Today Sofia is a dynamic Eastern European capital, distinguished by its unique blend of European and Communist architecture, as well as many beautiful orthodox churches. It is also one of the few European capitals with beautiful scenery and developed ski resort near it - the Vitosha mountain. Sofia also has the largest airport in the country, built in 1930. Located in the eastern part of town, just 10 minutes from the center. Over 25 airlines fly from to and from Sofia Airport and daily flights to Sofia is associated with Athens, Paris, Vienna, London, Rome and other European cities.